The intention of this programme is to enhance the relationship and build purposeful collaboration between OtagoNet and. DunedinNet While recognising the unique context of each community, strong synergies exist between the secondary and area schools of the southern South Island region. This programme explicitly seeks to establish robust and sustained knowledge building ‘communities of practice’ of teachers across the region’s schools, which are committed to ongoing purposeful pedagogical change aimed at meeting the changing needs of all students, as ‘confident, connected, actively involved, lifelong learners’. 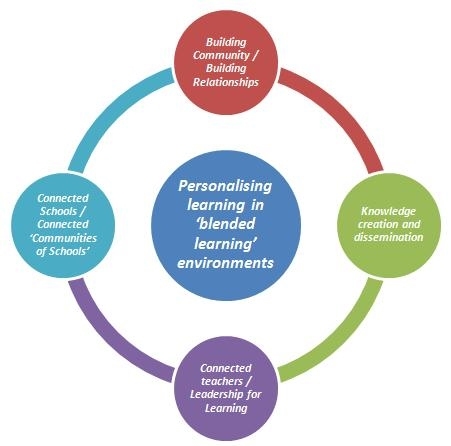 The central focus of the programme is to develop teachers’ capability (and schools’ capacity) for personalising learning for students, particularly students working in blended learning environments (online/distance; ‘face to face’ classroom; and vocational/community based learning environments). We are committed to implementing a framework of sustainable professional development. 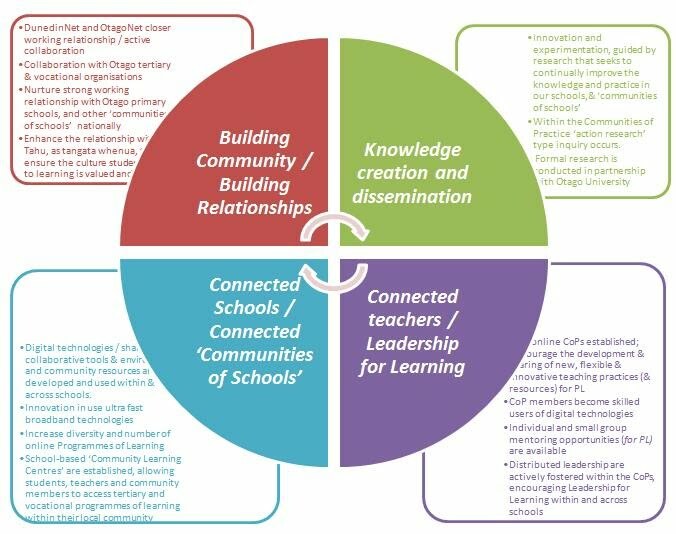 The establishment of knowledge building ‘communities of practice’, with explicit norms of ‘risk taking’, innovation and inquiry about teaching practice, can ensure the ongoing professional growth of staff and the development of a culture for personalising learning to grow within our schools - a culture, where ICT is integrated, relevant and enhances learning, and supports ongoing innovation.